Sol Exodus is a diamond in the rough. It doesn’t try to simulate an entire galaxy of barren worlds or force you to learn about things like trade routes or remember the market price of Unobtainium. What it does do is space combat and manages to do it well while including a nice selection of mechanics that simplifies but also diversifies the experience. 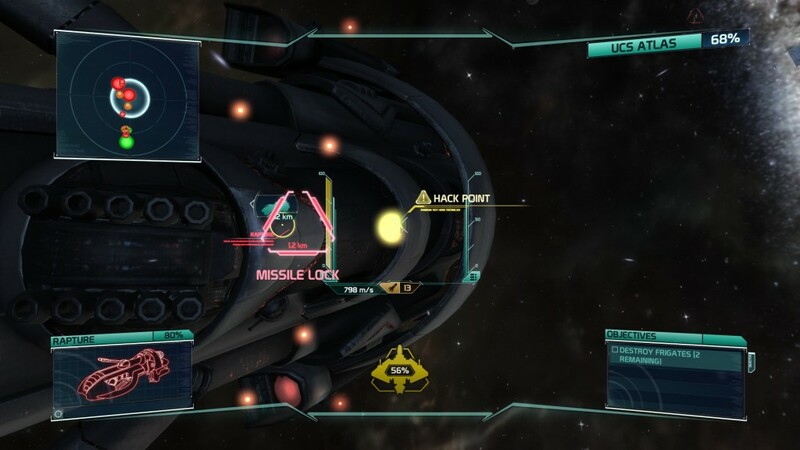 Sol Exodus is a space combat game divided into linear missions. It tells an interesting tale about the last days of mankind. By 2500, the Earth is used up and the Sun is dying (talk about bad luck). So as-per-usual when it comes to this old hat of a plot line, ships leave the Sol System (where you are …probably) in search of another habitable world. They eventually discover one and right on queue the fanatical religious zealots decloak to ruin their day. In the very next scene, the 10 year journey back to Sol has just been completed (um, okay?). They’ve returned to tell what remains of humanity that their is hope and upon reaching Pluto they discover that while they were away most of the solar system has been conquered by the unambitiously named cult, the Children of Dawn (CoD). The CoD’s motivations are never satisfactorily explained however and they come off as a mostly two dimensional threat. The story that unfolds is interesting enough and suitably told through radio chatter. Even though it clearly takes significant influence from the plot of the excellent BattleStar Galactica series, it offers its own twists unique enough to keep you interested and involving enough to wonder what is going to happen next. Test drive a Hades today! The ship you pilot throughout your adventure is a Hades class fighter that is apparently many times more durable than any of the other enemy fighters thanks to the ‘upgrades’ installed by lead character, Commander John Everyman (or whatever). Your ship possesses a specific assortment of weapons. The standard weapon is the Gatling Lasers which fire two streams of energy projectiles at your target, when fired for a sustained period it overheats and will require a few moments to recover. …with the ability to dock back at your capital ship and immediately repair and resupply, fighters will never become a serious threat. Your only missle type is the Homing Missle, which is so incredibly accurate each one is basically a guaranteed ‘free-kill’ if fired correctly and with the ability to dock back at your capital ship anytime you want and immediately repair and resupply, fighters will never become a serious threat. Your only other weapon is a slow moving energy torpedo. This weapon is cleverly used to take out bomber class ships with a single blow but only if you get close enough to make the shot connect. This weapon shares a heat gauge with your Gatling lasers and will quickly overheat your fighter leaving you without lasers after two or three bursts. Sol Exodus doesn’t have any sort of meaningful collision damage system in place. I have run my ship at full velocity directly into dozens of other ships and taken no damage, it tarnishes the believability of the experience and is boggling why such a system is omitted considering that most, if not all, space sims of note have severe penalties for clipping the environment, some even being so cruel as to make it an insta-kill offense. But Sol Exodus eschews this convention and allows you to smash into the hulls of frigates and sometimes even the interiors of ships themselves without significant consequence. It hurts the game’s realism but does keep restarts to a minimum. Large frigates are too heavily fortified and initally immune to damage when they first appear on the battlefield. Eventually “hackable nodes” will be identified scattered accross their hulls. When the player targets one these nodes they initiate a simple ‘hacking’ minigame while still attempting to dodge incoming fire. Once you get your reticle over a node and press the hack button, you will be displayed a series of alphanumeric characters. Then you will be asked to select that specific sequence from a multiple choice list. 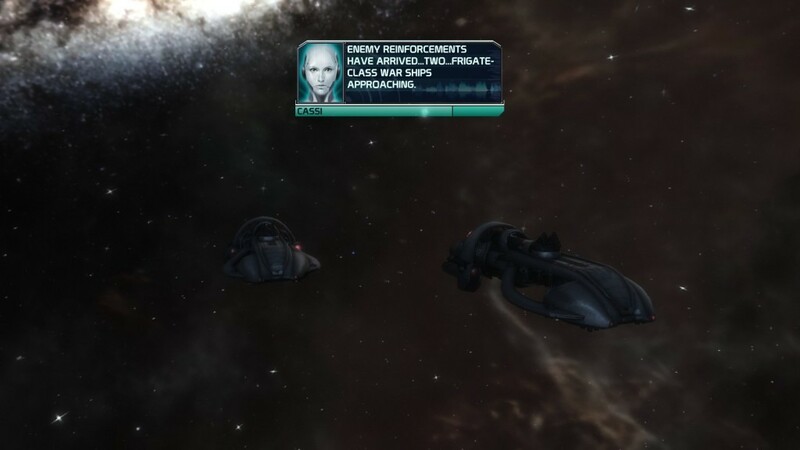 Selecting correctly allows you to choose subsystems on the frigate to shutdown or scramble, such as being able to disable their missle systems or causing their turrets to target friendlies. I think this is the most rewarding mechanic in Sol Exodus. 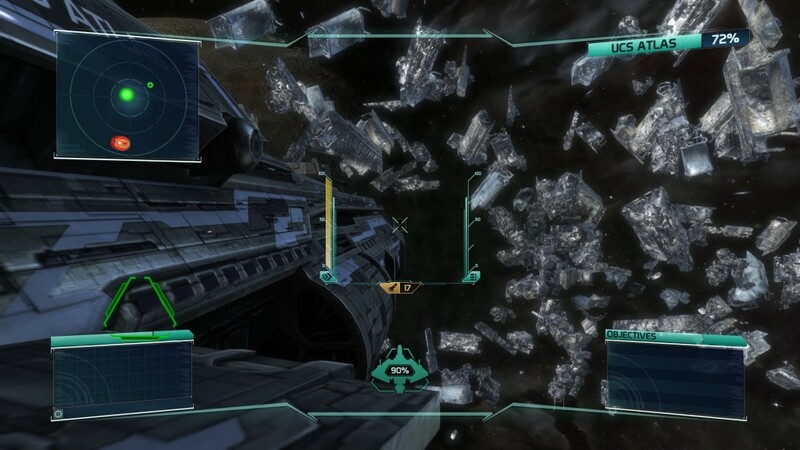 As you approach a large ship you will be under the onslaught of it’s multiple turret batteries. It’s tense and exciting to duck and weave between smatterings of gun fire while trying to remember a sequence flashing by that will allow you to shut down the turrets causing you the trouble. 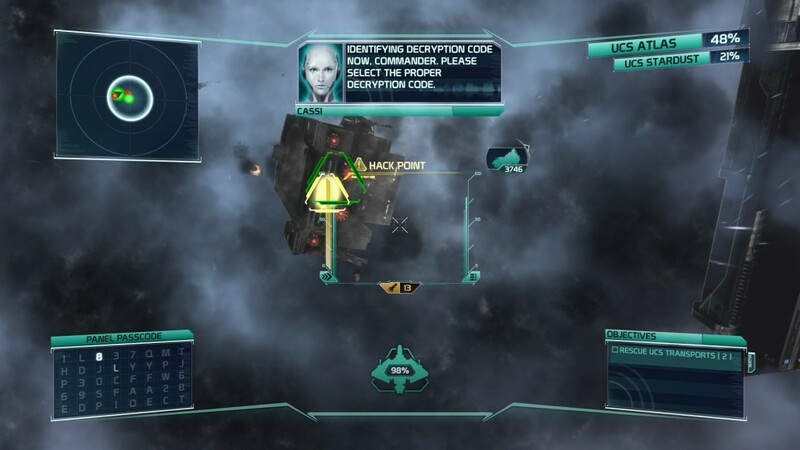 Once you have made multiple successful “hacks” against the ship, disabling key systems along the way, you will be presented with the option to download it’s blueprints and identify weaknesses in it’s hull, this is when you unleash all your weapons with surprisingly devastating force and take out the largest of the enemy ships. Sol Exodus features the absolute barest amount of ship customization. After each mission you are awarded one or two skill points based on your performance, these can be placed in one of three facets: Weapons, Defense or Afterburner. Its unfortunate that the developers didn’t include more meaningful customization like the ability to swap between missile types or choose between greater shielding or more effective engines. This would have made the action far more engaging, allowing you to tackle enemies as you see fit rather than being forced to rely on the same set of weapons throughout the game. If your looking for the next Wing Commander, Freespace or even Freelancer this isn’t it. But that’s not to say that Sol Exodus isn’t well worth it’s extremely reasonable price tag. It is a game that is simple in scope but well executed. It’s design philosophy most closely resembles the 2000 game, Starlancer. Sol Exodus takes place completely within a first person perspective with a fixed reticle and GUI overlay, their is no cockpit view and even more disappointing, no third person view either. This is a feature which is so often overlooked, ineffectively implemented or (as in this case) simply not present that anytime a space sim has a good third person view it immediately gets major points in my book. Why so high? It looks good running on the Unreal engine (naturally), it’s fun to play, has tight controls and an interesting storyline which is exceedingly rare when it comes to modern space sims. Why so low? It isn’t innovative enough to hail it as the glorious return of the space shooter, but it has a very good base and I hope Seamless Entertainment continues to build upon this foundation in future space faring projects.